The triennial IDEA show focusing on the nonwovens and engineered fabrics industry heads to Boston in May. The Association of the Nonwoven Fabrics Industry (INDA) is gearing up for its triennial IDEA show, to be held May 2-5, 2016, at the Boston Convention and Exhibition Center in Boston. IDEA — a show catering to the nonwovens and engineered fabrics segment of the textile industry — is held every three years in a rotation schedule with the INDEX show in Europe and ANEX, which is held in Asia. This year, INDA anticipates approximately 500 exhibitors and 7,000 visitors will participate in the event, which kicks off with a welcome reception sponsored by Velcro Industries, Monday, May 2, at the House of Blues® Boston. The exhibition and conference begin May 3 and run until May 5. The show floor is open each day from 10:30 a.m. until 6 p.m., and closes at 4 p.m. on the final day. Each day, conference sessions will be held from 9 a.m. until 10:30 a.m. prior to the exhibit halls opening. On day one, speakers will give presentations under the umbrella topic Market Intelligence: Greater Europe & China/Asia Pacific. Day two focuses on Market Intelligence: North America; while day three of the conference will cover Market Intelligence: Middle East & South America. Expert speakers come from a variety of nonwoven and engineered fabrics associations, companies and consulting firms. Presented by INDA in partnership with “Nonwovens Industry” magazine, the IDEA16 Achievement Awards are presented every three years in conjunction with the IDEA conference and exhibition. IDEA16 Long-Life Product Achievement Award: Best new durable product utilizing engineered fabrics. Products and innovations introduced since IDEA13 had to be nominated to be considered for an award. Winners will be recognized Wednesday, May 4, at 9:30 a.m. after the first conference presentation. “The big ideas start here at IDEA16, The World’s Preeminent Event for Nonwovens & Engineered Fabrics,” said Dave Rousse, president, INDA. 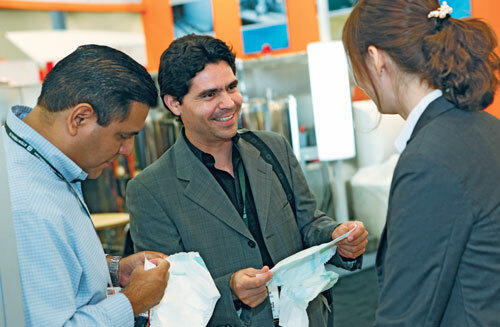 “Every three years, the world of nonwovens and engineered fabrics convene for three days of international business building, spectacular product and equipment displays, valuable interpersonal interactions, and back-to-back meetings. For more information about IDEA16 and to view a full event schedule or register, visit inda.org/idea16/.